In the ancient world, dance was used to express important truths about the human condition, and this significance can still be seen today in representations of dancers in ancient art. Sculpture, relief carving, vase painting, and other visual media offer a glimpse of the function of dance in antiquity. In the modern era, the Ballets Russes, a Paris-based collective established by Sergei Diaghilev (1872–1929), revolutionized dance and revived European and American interest in ballet, in part by drawing on notions of dance from the ancient world. Ballets Russes choreographers, designers, and collaborators looked to ancient culture for subjects and themes, and for a notion of dance as an expressive art form integrated with ritual. 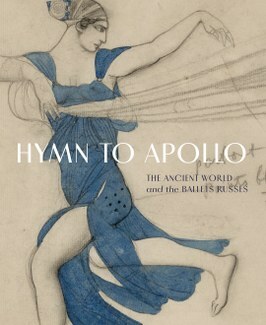 Hymn to Apollo explores the role of dance in ancient art and culture and how artists of the Ballets Russes returned to the past as a source for modern expression. Thematic essays and lavish illustrations present a fresh perspective on ancient artifacts, and watercolors, illustrations, sketchbooks, photographs, costumes, and other archival Ballets Russes material show how artists turned to the ancient world to create something new. Contributors include John Bowlt, Rachel Herschman, Kenneth Lapatin, and F. G. Naerebout. Fully illustrated, color catalogue featuring scholarly essays by leading historians and curators, as well as a comprehensive object reference section. Published by the Institute for the Study of the Ancient World and distributed by Princeton University Press, it is available at the ISAW Gallery Shop and on the Princeton University Press website.